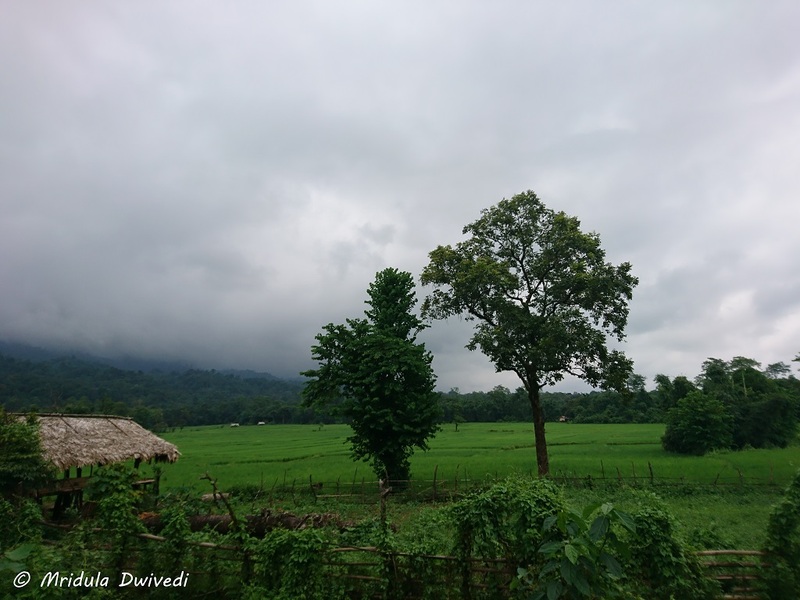 What do you do when you are not attending the Solung celebrations at Pasighat? 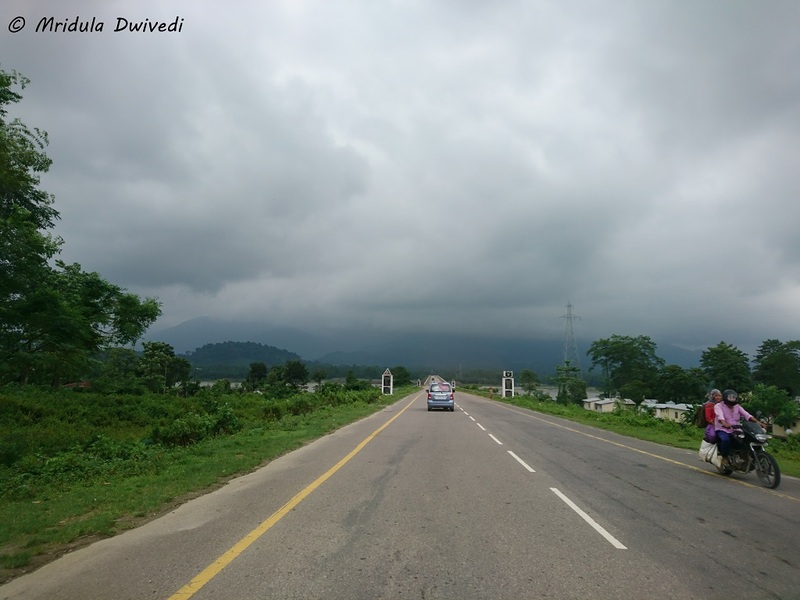 Why you go sightseeing around Pasighat! I admit I could have done a better job. But the little that I saw, was refreshing. 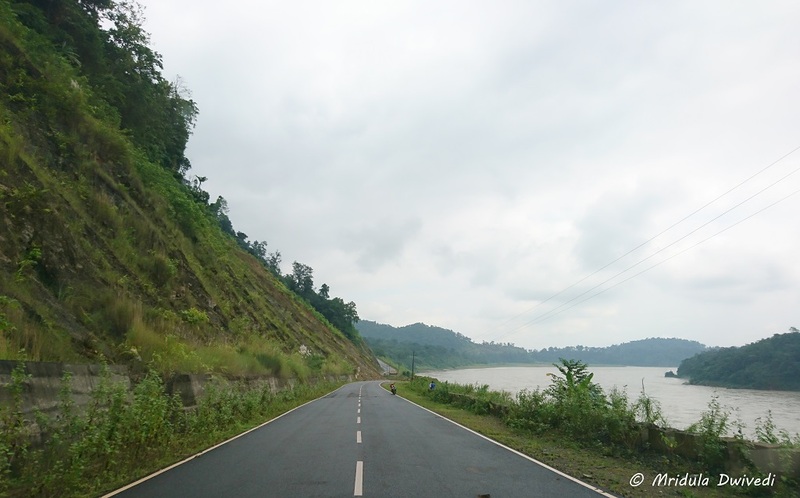 Close to Pasighat are two small villages Balek and Roing. I had two beautiful guides with me, Yasup and Nani. 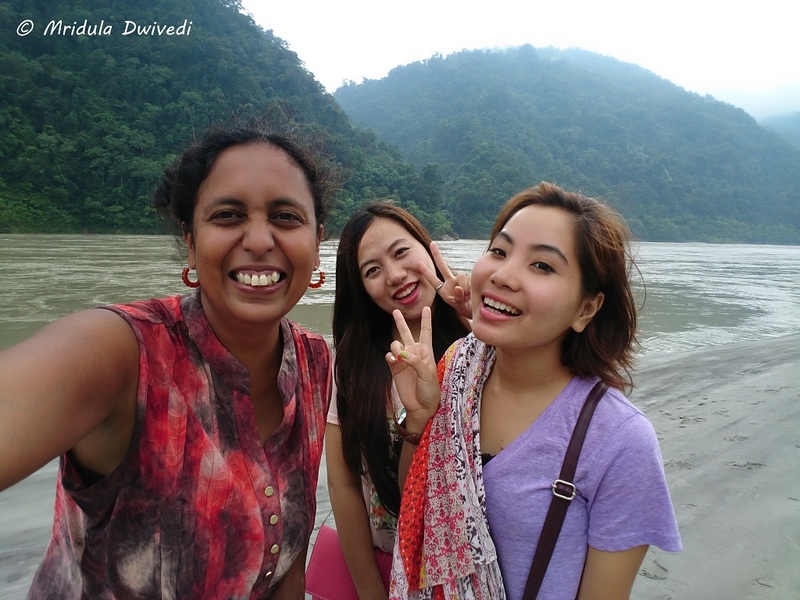 My friend Nuyee (of Arunachal Pradesh Tourism) asked the girls to take me around. Here we are standing by the Siang River but it comes later into the story. The Bridge Near Balek Village! Our first stop were Balek and Roing Villages. 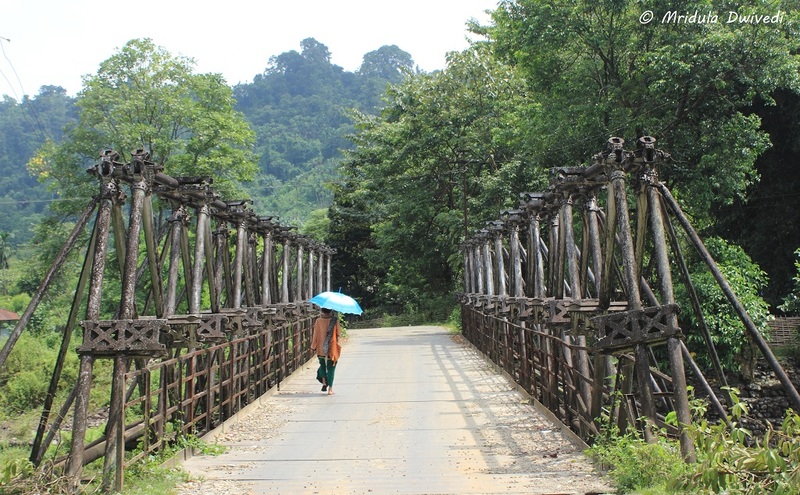 This quaint bridge took us to Balek Village which is 6km away from Pasighat. It is a small village with a cluster of traditional houses. However there were many cars and bikes parked in front of the bamboo homes! There was a large community center too. The View from the Bridge! I was fascinated by the stream near the village but the locals hardly gave it a second glance! I guess we all take what we have completely for granted! A little ahead of Balek is Roing Village and the road stops there! If you wish to explore further you have to walk and cross the mountains! A lady from the village told me that route is hardly used now as there is a road to the next village. Talking about roads, they are reasonably good in the area. It was raining and yet most of the roads were in decent shape. I had my share of potholes but they were not the norm. 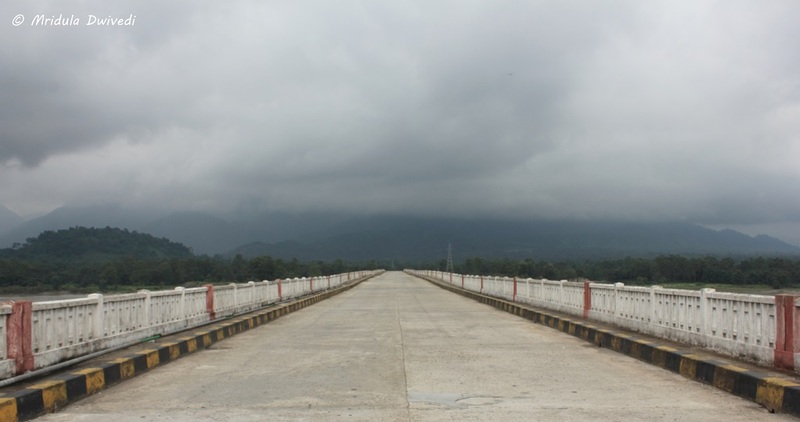 The Pasighat Bridge Over River Siang! 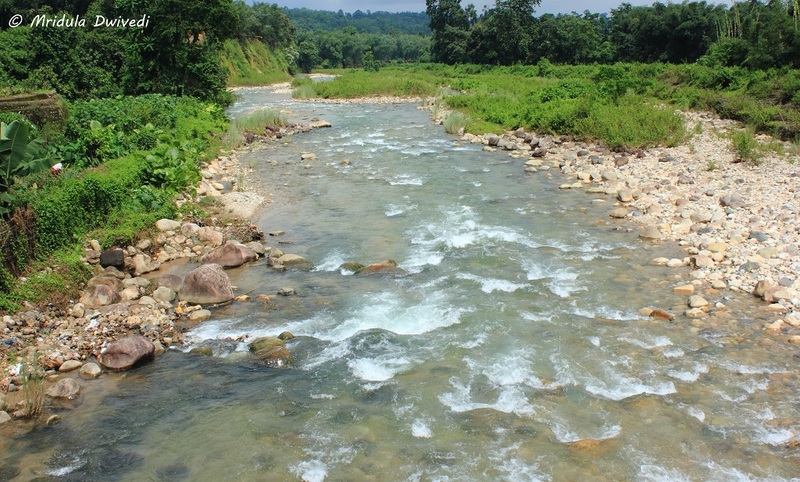 You get to witness the majesty of the River Siang right from the Pasighat Bridge which is close to the town. It is even closer from the Mela ground, where Solung Festival took place. However you need to continue driving ahead to see the real beauty. How Green is the Place! This was the first random stop I made along the route. The whole place is green but this corner was specially so. It was easy to fill my lung with fresh air! 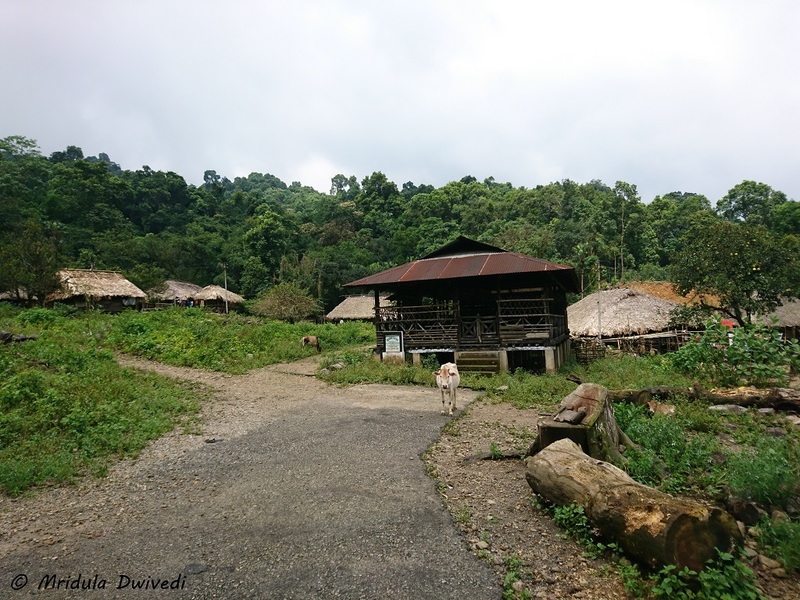 The girls knew the exact spot where we could get out of the car and walk up to the Siang River. 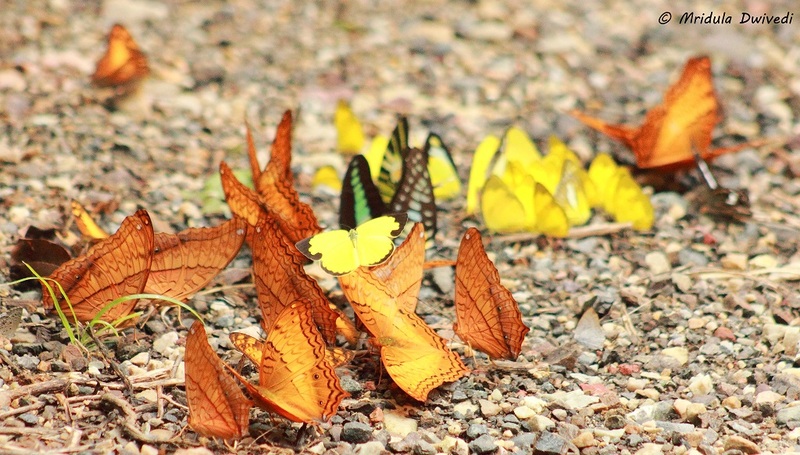 On the way we stumbled upon a meeting of butterflies and trespassers were welcome! It is easy to be happy in such places! We were the only people at that point of time but the number of beer bottles left behind told me that it was a popular local spot! 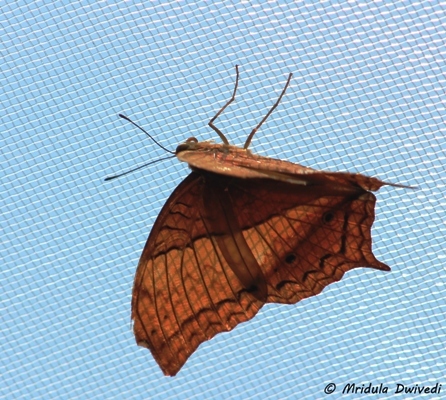 Not all butterflies were attending the meeting. Some of them were interested in the flowers rather than sitting by the road! If you are a fan of driving you will enjoy the route. There was hardly any traffic when I went. If you continue driving ahead you would reach the Daying Ering Sanctuary. I could not visit it this time. I am told there is rafting and there is a waterfall nearby. But all that has to wait for the next trip! There are not many hotels at Pasighat. The hotel that I stayed in, Aane, is below average. I am told Serene is a better hotel. But then to see some magical places you need to go through some discomforts! Even though I know about the lack of the hotels, I am already plotting how can I get back to Arunachal Pradesh! PS. 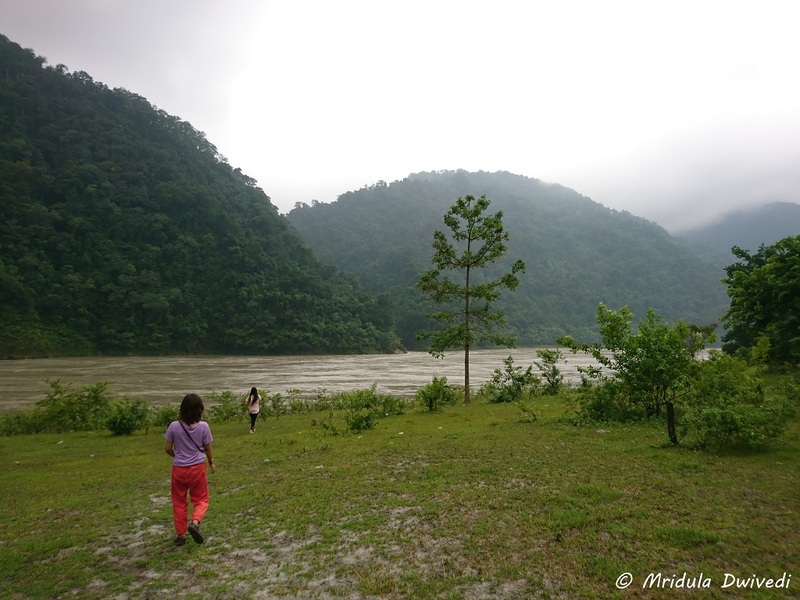 I was invited by Nuyee Talong from Arunachal Pradesh Tourism on this trip! 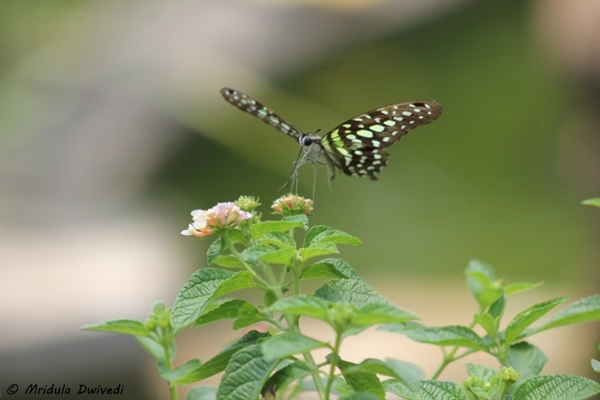 We made an unscheduled stop at the Bai Orchid and Butterfly Farm Chiang Mai in Thailand and I am glad we did. When I went in there were a lot of orchids in bloom. 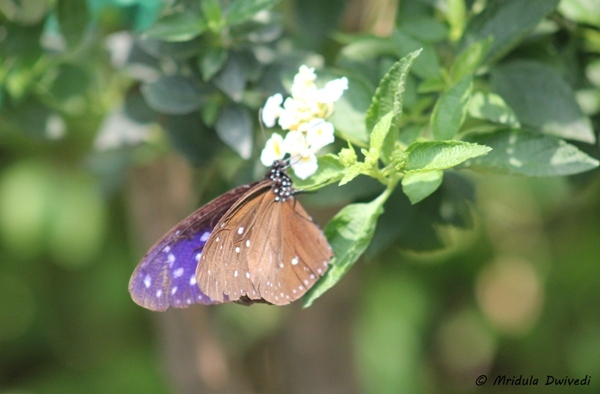 There were quite a few butterflies in the enclosure too. 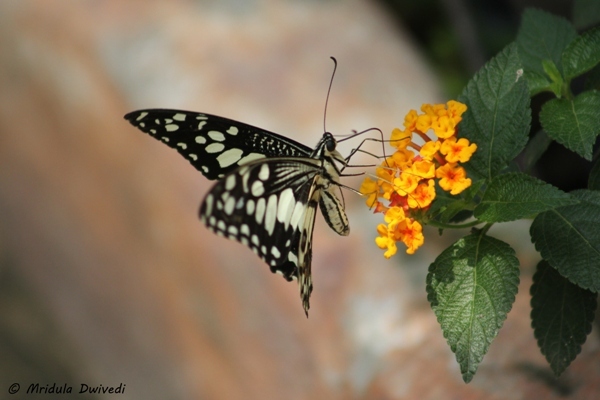 I would any given day see the butterflies in the wild but it was a large enclosure full of flowers, so I think the butterflies were not at risk. However, I may be wrong in assuming this and I am willing to be educated. 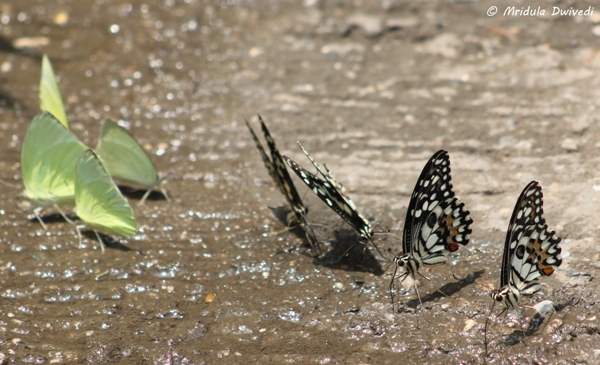 As soon as we entered the butterfly enclosure we saw this bunch sitting on the ground. I have seen this once before and people who are in the know told me it is because of the salt content. Apparently butterflies like salt. 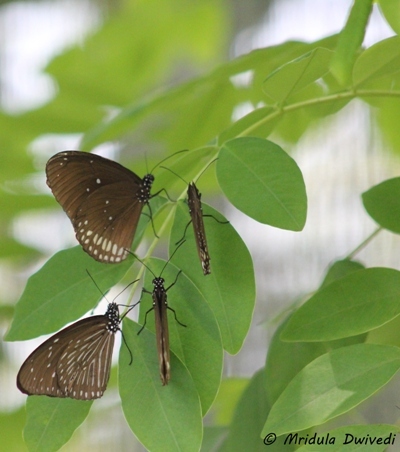 The top enclosure was made of net and butterflies were hanging for it. This beauty made only a brief appearance on the net and then hid itself effectively in the flowers and bushes. By now you might want to ask me, where are the orchids. Well they are there but I am going to do another post on them as I have way too many butterflies to show! How I wish I knew the names of the butterflies but I do not know even a single name. What a pity! I guess it is about time I tried to change it, after all I can identify about a hundred birds, so why not butterflies too! 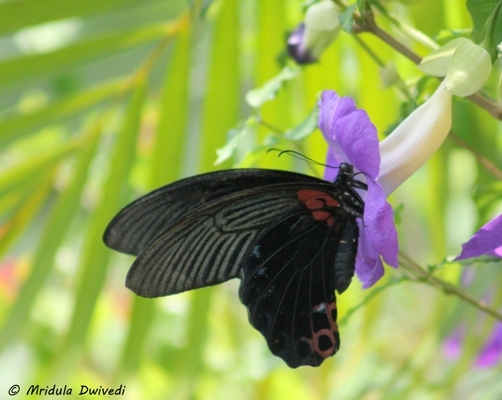 When I was at the Bai Orchid and Butterfly Farm, it was not too crowded. 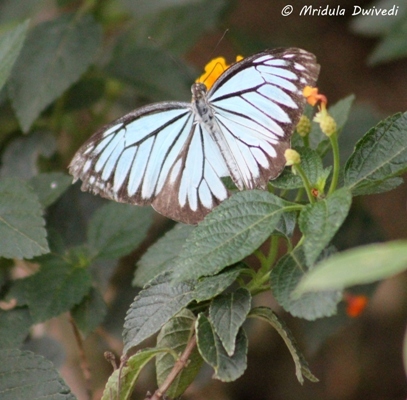 The tourist who were there in the enclosure were super quiet and mindful of not scaring the butterflies. While we were admiring the butterflies a friend from our group was visiting a place where they had King Cobras! He asked if I would like to join, but the chicken that I am, I shuddered at the mere idea! I have to admit it was much more easy to click pictures in the enclosure than it has been to click out in the open. For one there were a lot of butterflies and they seemed to be used to human presence. You could use any lens to shoot them, even your cell phone, as they were quite close at hand. 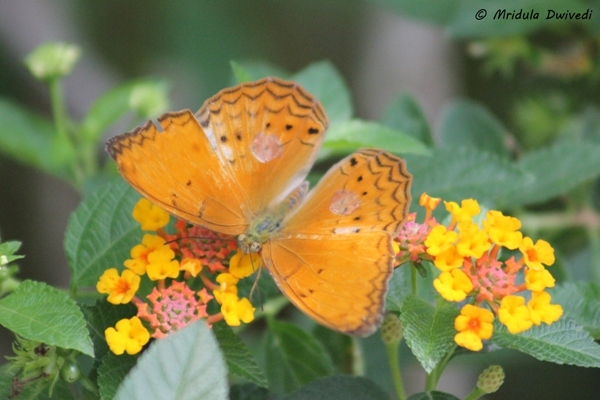 They were quite fond of lantana flowers. 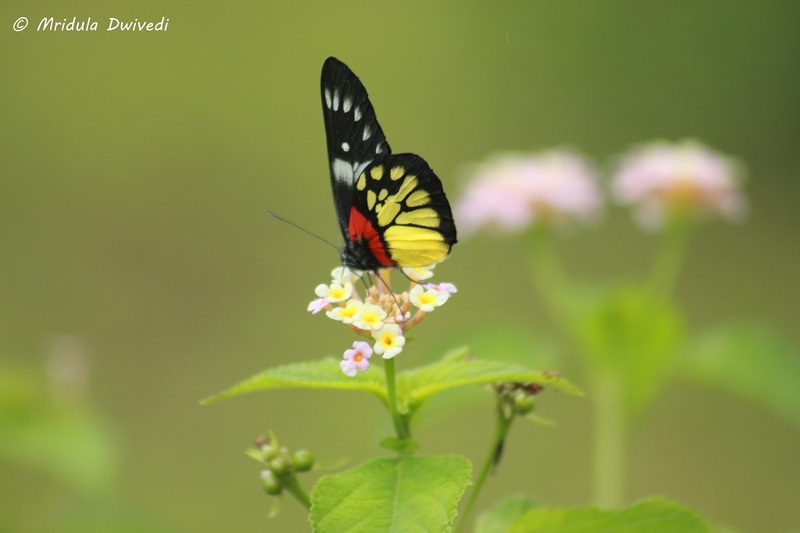 This butterfly at the first glance would look of a dull brown color, till it flapped its delicate wings and gave you a flash of blue! And then there was this one, of pale blue shade, happily going about its business. 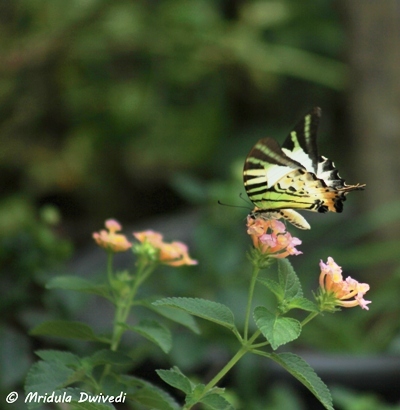 The Bai Orchid and Butterfly Farm Chiang Mai is a small place but it is well kept. There is an entrance fee at the gate. In the next part I will show you the orchids from the place! 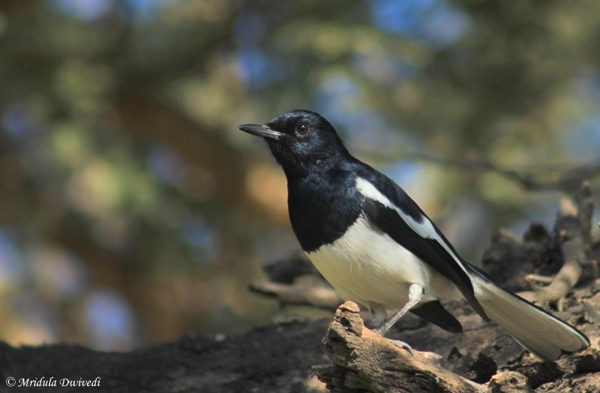 We did a quick trip to Sariska Rajasthan over the extended weekend. This was the first time in 2014 that all three of us traveled together! I took Chhavi out and Seshadri took Chhavi out, I went out and Seshadri went out but somehow the dates never coincided for the three of us. And more often than not I was the guilty party! 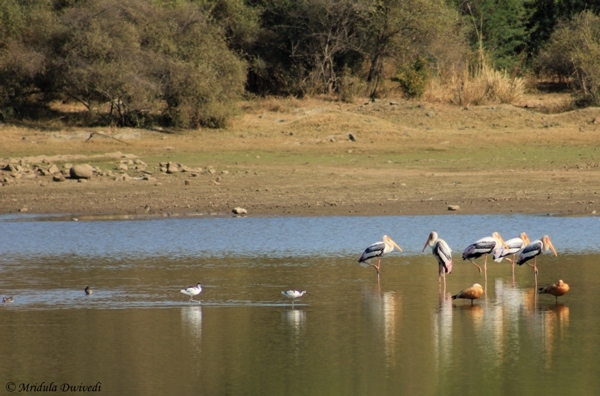 But we finally managed to go to Sariska for a peaceful vacation. In all our visits to Sariska we have stayed at the RTDC’s Tiger Den. It is a simple hotel but right at the edge of the forest. 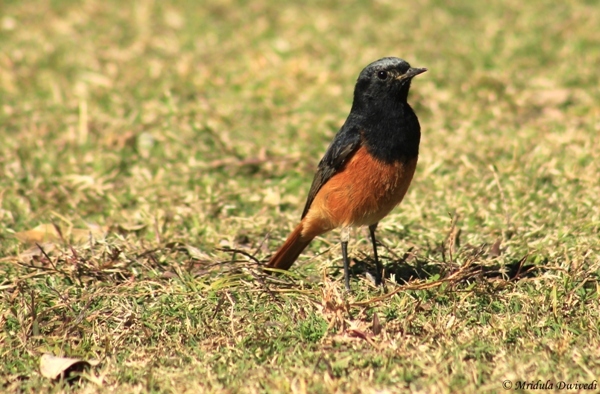 The best part of the deal is their huge lawn from where I do my armchair birding. 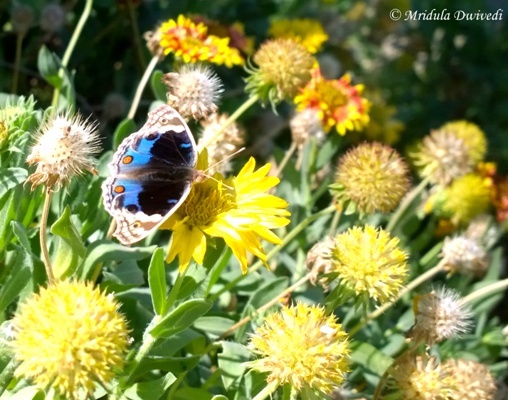 Sometimes I manage to catch butterflies too, on my cell phone! It goes like this. I usually sit in a chair in the lawn, basking in the sun. Then a bird will come close by and I click a picture, usually without getting up from the chair. Sometimes they do force me to move a bit to get a better angle. By the way, did you notice the blue sky? The best part of this vacation was the sunshine. There was no fog at Sariska. Chhavi could sit in the lawn and play with mud and other kids, while Seshadri and I were just too happy to laze around reading books. All the pictures up to now have been clicked in the hotel premises. Now what a luxury it was to click so many birds simply by sitting in a hotel lawn! And it is not that the birds come for a fleeting second and then go away. They keep coming back, looking for food. Having said that, no one can sit in the lawn and eat anything because of the monkeys. There are just too many monkeys around. They don’t come nearby unless you have something to eat. So all the food items have to be consumed indoors, unless you wish to share it with the monkeys. 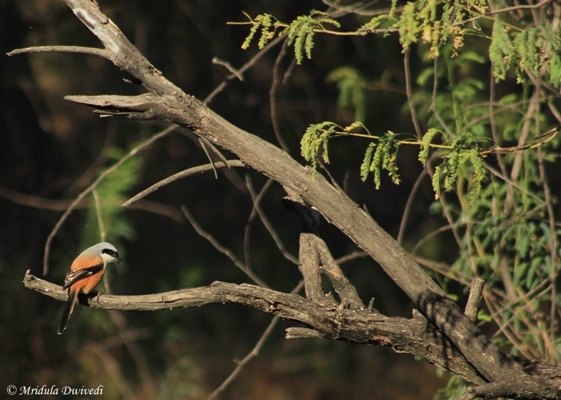 Then I took a short walk out of the premises of the hotel and found this Shrike in a tree close to the road. It gave me only one opportunity to click the pictures! And then it vanished protesting further inside the overgrowth. 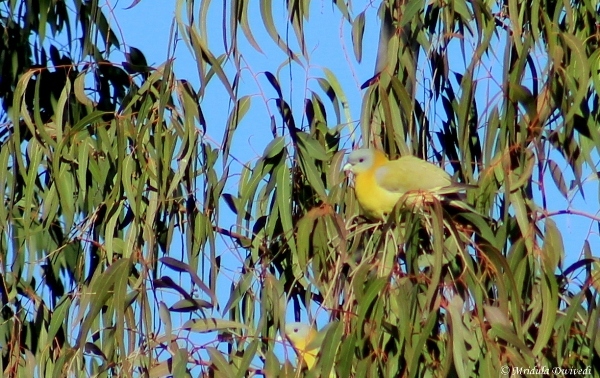 There were a great many yellow toed green pigeons by the road but they took a thorough dislike to my presence. 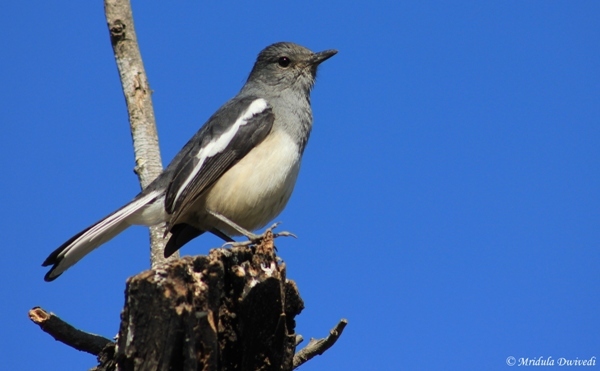 They flew in droves to far away trees. 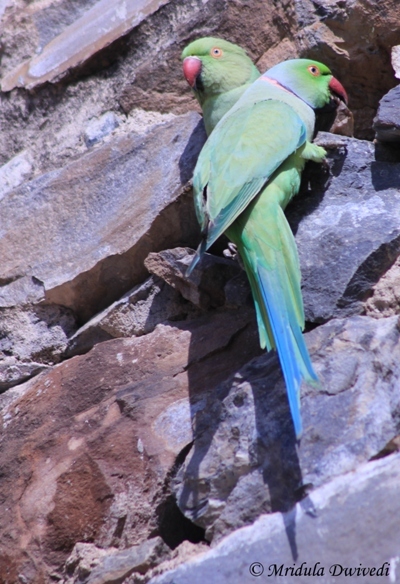 So, managed to get this one picture on my puny 75-300 mm zoom by cropping ruthlessly. Chhavi and I did a safari in the national park. This was the send visit to the jungle for Chhavi. She was having a conversation with other girls (working professionals) in the canter and in some context she told them, “I know because I have been here before!” Seshadri refused to budge from the hotel. He anyway has seen a tiger in Sariska on his first attempt, a trip he did solo. We didn’t see any tigers on this trip. But there was this group of painted storks with rudy shelducks for company! 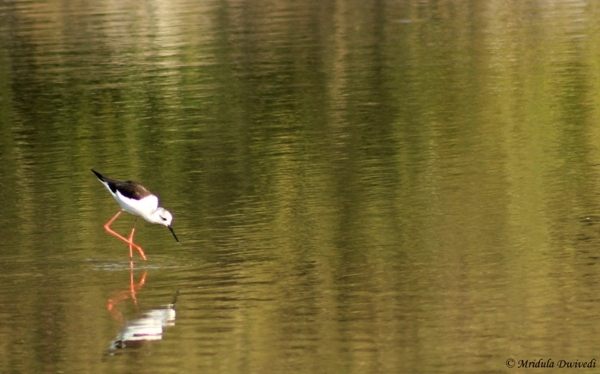 Then there was this lonely black winged stilt going around in the lake in search of food. The lake is a very scenic spot in the middle of the forest. 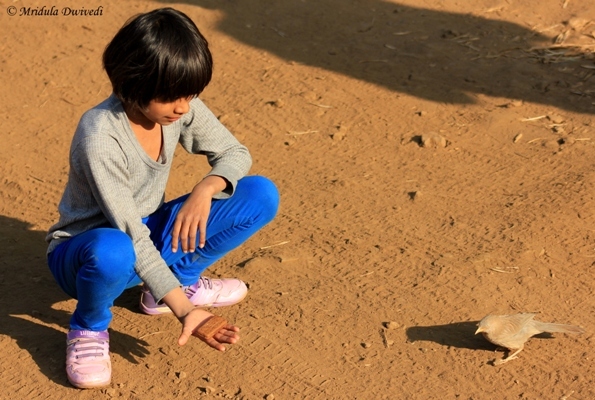 And I sign off the travels of 2014 (only theoretically because some of the tales are going to spill in 2015 as well) with Chhavi trying to feed a jungle babbler at Sariska.